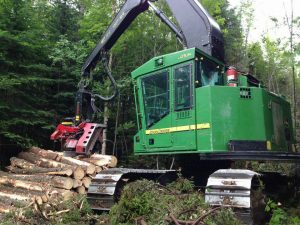 Master Logger Spotlight – JBR Logging Inc.
ASHLAND, MAINE – Master Logger Jeff Hummel started his business, JBR Logging Inc., in June of 2008 with a John Deere forwarder and one employee, working double shifts. 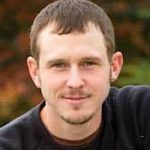 Jeff, who goes by J.D., didn’t grow up in a logging family, but in Aroostook County in far northern Maine there were plenty of loggers around, and he got into logging through his best friend. “He was a couple of years older than me, I always looked up to him, and his family, they were all loggers, and I’m just following in their footsteps,” J.D. said. 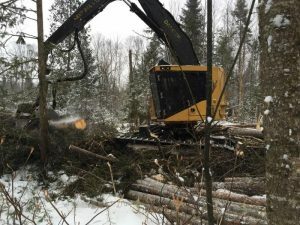 While logging can be a challenging industry at the best of times, JBR Logging has managed to grow slowly since 2008 in spite of Maine mill closures and other obstacles, adapting to whatever the market throws its way and changing equipment and focus as needed. In 2010 the company bought its first processor, a used Tigercat, and added two more employees. For awhile JBR Logging ran three shifts and at one point increased to six employees total. Upgrades in equipment came along the way as well as a variety of logging jobs. JBR spent a lot of time harvesting steep slope terrain for Irving Woodlands LLC when it was starting out, but in time moved away from steep slope and got into higher production jobs on more typical terrain. The company eventually sold its forwarder to focus more on cutting and processing, and generally subcontracts forwarding out now. Today J.D. and his 3 employees operate the Tigercat processor, an LH830C with a Log Max head, and have added a John Deere 703JH with a Waratah head. “We have a feller buncher ahead of us now, which greatly improved quality as well as production,” J.D. said. The company works mostly in Aroostook County, harvesting for mills, but jobs have taken JBR nearly to Quebec. The company faces the same challenges most loggers are dealing with in northern Maine right now; loss of mills hurting the markets, and weather – 2015-16 was the toughest winter for logging J.D.has seen – top the list. “That’s logging though, always something working against you, it never ends, but that’s what we do,” J.D. said. These days, professionalism is critical in logging,and J.D. realized that early in his logging career. It was out of a desire to raise the professionalism of the company that he became a Master Logger in 2013. “I always like to make my business more professional, anything you can do to make you more professional is a good thing – any certification that helps me out in that way,” J.D. said. J.D. has no plans to leave logging, and sees a future for JBR of continuing to adapt and increase its professionalism in order to keep operating successfully. Most Master Loggers would agree with that. What a remarkable young man. Great to read a story in these times about ambition for someone so young.